When we choose to be present with the challenges in our lives, and take the time to examine them, they can serve as a portal for growth. Yet, many of our challenges are too much to face alone, or too sensitive to share with friends and family. Laurie believes in the power of connection, in the human capacity to grow and find meaning in our own unique journeys, and in the ability to bring intentional change into our lives. Laurie uses a relational-cultural approach and strives to connect in an authentic, therapeutic way to facilitate growth, awareness and openness to change for those who choose to reach out for professional support as they face challenges along their path in life. Laurie earned her MSSW from the University of Texas at Austin where she received extended clinical training at the Counseling and Mental Health Center. Laurie found the field of clinical social work after practicing as a pediatric occupational therapist for over eight years, and marketing in health and wellness for a handful of years. In addition to her professional education and experiences, Laurie has cultivated personal growth from many years as a curious, mindful parent and partner. 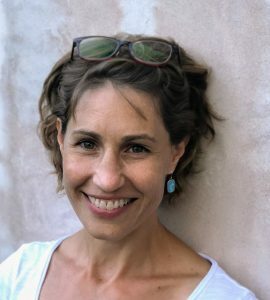 Laurie maintains her calm presence through the practice of yoga, cooking, mindfulness, nature walks with her dogs, and time with her husband and daughter.